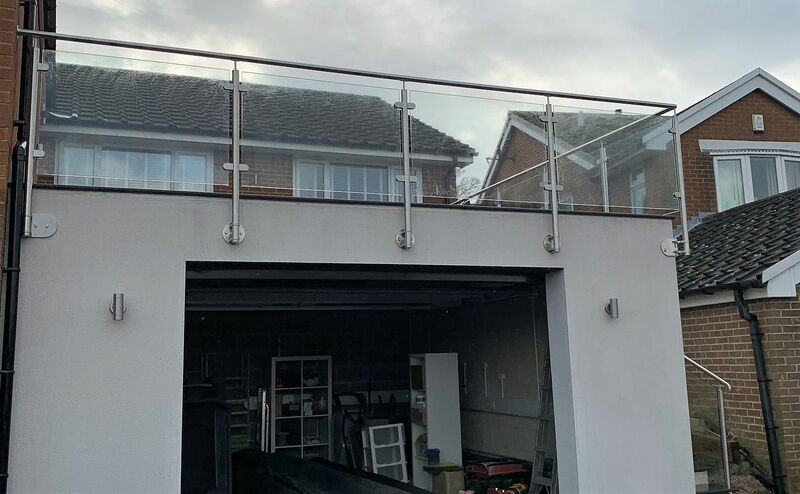 Jenna got in touch after finding us online and opted for our most popular design balustrade comprising stainless steel upright posts, toughened glass infills and matching stainless steel top handrail. The whole system was side mounted to form edge protection to the balcony area that had been created on the top of her new garage. The same balustrade was also used to provide safe access up the adjacent staircase. The garage roof covering was a Sarna membrane which should not be fixed to, where possible, so the whole balustrade was side mounted to the solid masonry walls to avoid puncturing the waterproof membrane. The design, manufacture and installation process was completed over a period of 3 weeks with installation taking two days. This glass balustrade / balcony system is priced by the meter and installation costed on an individual basis subject to postcode. Completed image below.